The Maher Cup | Graham English Remembers Young & the Maher Cup in the 1950s. 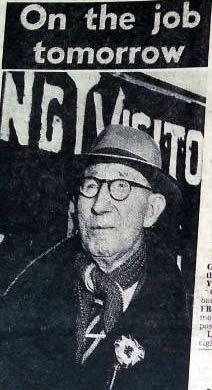 In the 1950s rugby league in Young was run by Billy Kearney. Bill ran a men’s wear store in Boorowa Street at Young and was both a good businessman and a really able administrator of rugby league. He lured very good players like Pedro O’Connor and Doug Cameron to Young and encouraged Ronny Lynch, the Perrin brothers and other locals. At least one year Young won Group 9 and held the Maher Cup all season. Young played at Alfred Oval. It was named in honour of former mayor Alf Rabbets but as there was a rabbit plague for all the 1950s they named it after his first name. My father Perce English often did the ambulance at the Young games. In those days country towns payed one or two ambulance drivers and the rest was done by honoraries. My father was one of those. He used sit on the sideline with a large bottle marked ‘Aqua’. If he labelled it ‘Water’ players kept drinking it and he’d have to continue filling it. When players were exhausted he’d offer them the Aqua bottle. “What is it?” they’d ask and he’d say, “Just drink it,” and they’d be refreshed. In those days there was a turf wicket in the middle of Alfred Oval and after a few football games and a few frosts the middle of the field was all small rough spikes. Gravel rash was one of the main injuries that my father had to treat after games with liberal splashes of friar’s balsam. I don’t think there was hot water in the showers at many fields then either. The players may not have been as fit then as they are now but they were just as tough. When Young traveled to Tumut or Temora or somewhere else in Group 9 and they won the Maher Cup you could hear the team coming back. From about Wombat the cars would start honking their horns. In those days before random breath testing some of the locals drove home from games somewhat worse for wear. Occasionally accidents happened and once or twice people were killed coming home from Maher Cup games. Bad roads, inadequate cars and grog made life more dangerous than it needed to be. Ronnie Lynch began his football with Brother Cummins at Christian Brothers Young. He was playing Maher Cup for Young when he was fifteen or sixteen and one Saturday afternoon when Young were playing Cootamundra at Alfred Oval Lynch was tackled by Peter Diversi and Lynch broke his collar bone. Diversi had played for Australia before coming to Coota. There were some great players on their way up or their way down playing Maher Cup in the 1950s. Herb Narvo was another who played for Cootamundra. He died young sometime in the 1950s. Abe Hall had been a great footballer for Young and I think he played for NSW. He died young too. The Cup as found in a drain outside Young in 1955. One year the Cup was on display in one of the pubs at Young and someone stole it. There was a great to do with articles in the Young Witness and various locals offering opinions and gossip. 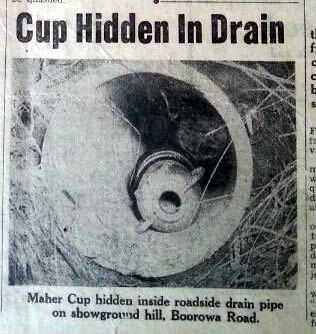 Finally after a tip off the cup was found under a culvert somewhere on the Cowra Road. In those days before television it didn’t take much to excite the locals. You probably know that originally the cup had a lid. It disappeared somewhere and as the Irish say, “No doubt drink was involved.” There’s nothing that happens now in rugby league that hasn’t happened before and usually it was in Group 9. One of my father’s older brothers Tom English played on the wing for Wagga and was secretary of the country rugby league when he died aged thirty nine just before the war. He had lured Merv Denton to play for Young. Bob Woodbridge. Scoreboard attendant at Young for more than 50 years. Photo. taken in 1962. Bob Woodbridge did the scoring at Alfred Oval. Bob was not academically gifted and occasionally got the score wrong to the delight of those he favoured and the cat calls of everyone else. He was also fanatically in favour of Young. He had the job for years and I think he kept it because he was part of the entertainment. This entry was posted in People, Places and tagged Graham English, Young. Bookmark the permalink. Hey,Do you have any think on my father Paddy Maloney playing in the Maher Cup in 1940 s to 1950s. Hi Phil. He’s listed in the Teams & Scorers section. I don’t have a picture. I will probably have a mention of him in a scanned Young Witness article or two or three…. I’ll have a look this week when I get a chance. I cannot believe this site does not have a mention of Tom English! he played against the touring Great Britain Sides in 1928 and 1932 he also went on to be one of the most respected and well liked Administrators in the CRL.